Panahi is banned from attending the festival by the Iranian government. While living under a modified form of house arrest, owing to his 2010 sentencing on a charge of propaganda, and forbidden from engaging in any filmmaking activity for twenty years, he has succeeded through subterfuge and a variety of ruses, to make films. “3 Faces” is his fourth feature since 2011. 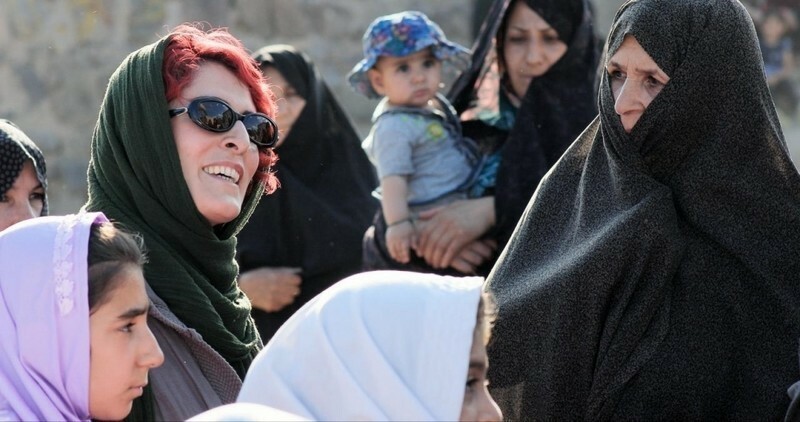 The film is a sly fictional commentary on life in Iran, hope, the country’s cinema legacy, and the continuity of history, disguised with folksy infusions of humor as a shaggy dog story. “3 Faces” opens with a cell phone video that is in effect a suicide note from a student, Marziyeh (Marziyeh Rezaei), to Behnaz (Behnaz Jafari), a famous film and TV actress whom she knows only by reputation. The young woman wails out her despair at being forbidden by her family to pursue her dream of attending the drama academy in Tehran, and will end by apparently hanging herself. Distraught, Behnaz, who is immediately seen as something of a diva and drama queen, goes AWOL from her current production and gets her friend Panahi (playing himself), who agrees that the video looks authentic and unedited, to drive her to Marziyeh’s remote rural home to investigate. The film’s leisurely pace belies the running number of references and tributes that Panahi weaves into the plot, starting with the film’s road movie form, which moves out over winding mountain roads reminiscent of the trademark visual of Panahi’s mentor and friend, the late Abbas Kiarostami. For a start, Behnaz and Panahi plan to arrive at Marziyeh’s village and discreetly search for a fresh grave in the cemetery, figuring that the villagers will not gossip the shameful news of a recent suicide to strangers. That this is not to end as a tragic journey is signaled by the proliferation of drily humorous encounters with locals. There is indeed a fresh grave in the cemetery, and it is fitted out with camping gear and inhabited by an elderly woman who has decided that she might as well take up residence early. A meeting with the owner of a sick bull blocking the single-track mountain road results in the film’s most comic incident. Making sure that Behnaz is out of earshot for a story he considers too racy for delicate female ears, the old man confides in Panahi that this is not just any bull, but a legendary stud. Regaling him with tales of the animal’s prowess, he says, referring to the lucky cows, “One sight of him and they moo with desire,” (which has to be this year’s best film line). Assorted journalists were already repeating it to each other on the way out of today’s screening. As the search for Marziyeh moves toward a satisfactory resolution, Panahi obliquely comments on the state of his nation in a number of humorous and ironic ways. When the two travelers first drive into the center of the village they are greeted by a crowd of residents, who mistake them for representatives of utility companies come in answer to their complaints about poor service. Realizing that it’s only a TV star and a film director, they turn their backs in irritation and head home. Taking an evening walk, Behnaz is entrusted with a special message for the handsome hero a local man hopes to petition to be his son’s godfather. Expectantly he holds up an old battered film poster picturing the pre-Revolution Iranian mega-star Behrouz Vossoughi [who has lived in quiet exile in the U.S. since 1979]. “The gentleman is abroad,” informs bemused Behnaz, as the insistent father presses a little package and a note into her hand. Actress, dancer and poet Sharzad, another pre-Revolution star, who was castigated as immoral and declared mad, is present in the storyline as the reclusive village woman with whom Marziyeh takes refuge, but she remains unseen. Panahi includes a lovely shot of her small home in the distance at dusk, with three dancing women silhouetted against the brightly lit windows. As this contemporary fable comes to a conclusion, Panahi holds a shot on the rough ribbon of unpaved switchback road, its own kind of infinity symbol. Far in the distance, several truckloads of heifers are seen barreling toward the village for their assignation with the famous bull. “Happy as Lazzaro,” by Italian director Alice Rohrwacher (“The Wonders,” “Corpo Celeste”), premiered today, the second of the three films by women featured in the competition. This film is also a fable with a social critique angle, and with a touch of magic realism. Visually, Rorhwacher references influences like Pasolini and the Taviani brothers, and thematically she adapts what is recognizable as portions of the legend of the taming of the wolves by St. Frances. The tiny and very remote Italian village of Inviolata is populated only by a few impoverished farm families, sharecroppers to the Marquise de Luna, who lives in luxury in the stone villa on a cliff high above the estate’s tobacco fields. If it weren’t for the electric lights and other contemporary signs, these folks would appear to be serfs from another age. Due to a flood long in the past, their farm is cut off from the outside world. Every now and then the marquise sends her husband down to to collect the crops and calculate the value against the paltry supplies he delivers. The farmers are always found wanting, and their debt to the estate mounts. In the center of this life is the Lazzaro (first-time actor Adriano Tardiolo), an angelic-looking youth, orphaned except for his ancient, wizened grandmother, and thought by all to be simpleminded. With wide liquid eyes and an open, honest face, he’s a hard worker, never complains, rarely talks, and does anything asked of him. And so it is that Tancredi (first-time actor Tommaso Ragno), the spoiled son of the marquise, runs away from home, but only as far as a niche in the cliff, and makes Lazzaro his vassal, required to serve him and kneel before him. Lazzaro does it all willingly, pledging his allegiance to this effete brat, who leads him on by suggesting that they may be half-brothers. Tancredi’s game is to send a ransom note to his mother, but the scheme backfires, bringing in police by helicopter. Shocked to discover a colony of people who can’t read, have no school, are paid no wages, and don’t know that sharecropping is illegal, the police load the residents onto buses and take them off. The film has so far put an emphasis on the processes and lush landscapes of rural life, a particularly evocative feature of Rohrwacher’s earlier film “The Wonders.” The narrative becomes muddled here when she introduces the wolf theme and departs from reality with implied supernatural connections, which become manifest after Lazzaro takes a deathly plunge off the side of the mountain but is revived some unspecified time later by a wolf. According the legend of St. Francis, he tames a wild wolf by promising the fierce animal that he will receive food every day so long as he agrees to never harm humankind again. When Lazzaro awakens, he is no longer the mere simpleton of the past, but conspicuously a holy fool with an unchanged youthful appearance even though it will soon become clear that many years have passed. Making his way to the city, he encounters several former friends from Inviolata, who take him in. In their years of freedom from the servitude of sharecropping, they have grown middle-aged or old, and live a squatters’ life as looters and petty thieves. Lazzaro finds Tancredi too, and is no less starry-eyed about paying homage to the now-old grifter with hair in a long white ponytail. In a parable-like incident, Tancredi’s still-arrogant but broke family is fed fine pastries out of pity, by Lazzaro and his companions, although they have nothing themselves. A parallel in which the rich are the wolves and Lazzaro is St. Francis only goes so far as the meaning of this whole tale becomes increasingly difficult to decipher. Lazzaro and friends are also symbolically turned away by the church but are followed down the road by what is implied to be an otherworldly spirit. The mix of socially relevant plot elements, religious symbolism, and cryptic fantasy is almost too much for one film to bear.